I couldn't think of a catchier title, so there ya go. 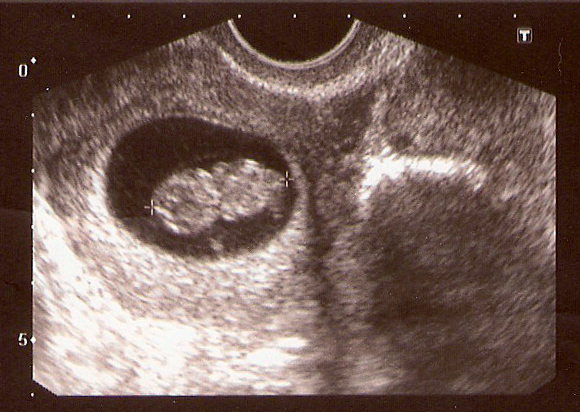 Best moment: the second ultrasound and hearing the heartbeat again...so lucky! Still no vomiting, just all day nausea. I am also way more tired now than I was before…just in time to go back to bootcamp. Another pesky symptom that arrived around 8.5 weeks is the occasional, but horrible headache. Mine seem to last for a couple days then fade away...and there is nothing I can take for them now so I just have to quit being such a baby...and grow one. :) Of course, when I am not nauseous I am dizzy now...lovely...this made bootcamp interesting. At one point I just had to stop and watch everyone else...doing squats and push ups just doesn't work when you are dizzy. I get a little worried because when my mom was pregnant with my brother she would pass out. I am officially starting to freak out again! The doctor said that every pregnancy starts at a 25% risk of miscarriage and that after you hear the heartbeat it goes down to 3% until the second trimester when it is less than 1%...but after reading some posts I feel like he told me that just to make me not worry…so many women have miscarriages between weeks 7 and 12…maybe I need to just stop reading the internet posts haha. Thank goodness my doctor's office does more first trimester ultrasounds than many others, so I get reassurance regularly. Easter weekend I was able to tell Leslie and Erika. I gave them fake easter eggs with a note inside that read “Cannot wait to meet you Aunt ___ love, Baby Tag” As soon as Erika opened it she saw the word baby and her mouth dropped wide open. They were shocked and excited! I also was officially a pregnant woman in a bar…drinking a Shirley temple. We sent an e-mail to all of our friends on Monday letting them in on our secret…what a great weekend!